Tammi Brown joined Moore Ingram Johnson & Steele in 2011 as a member of the Firm’s Litigation Department. 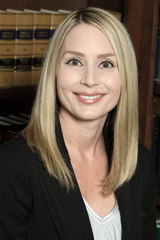 Her practice focuses on civil litigation in the area of insurance/liability defense. Tammi was admitted to practice in all State and Superior Courts of Georgia in 2007, and is also admitted to practice in the United States District Courts for the Northern and Middle Districts of Georgia. Prior to law school, Tammi completed her undergraduate degree with honors, and was employed for several years with a Fortune 200 insurance company. Tammi then attended Thomas M. Cooley Law School as an Honors Scholar where she completed her J.D. in two years. During that tenure, Tammi served as a clerk extern to the Honorable Richard F. Suhrheinrich, Senior Judge for the Sixth Circuit Court of Appeals. Tammi lives in Atlanta with her husband, and enjoys traveling and spending time with family and friends.